Personal consumption expenditures rose 0.2% in March after an upwardly revised 0.5% jump in February. A 0.4% increase in outlays of services and a 0.1% jump in purchases of durables lifted consumer spending, with a 0.3% drop in expenditures of non-durables were a partial offset. Real consumer spending is projected to advance by 3.0% during the second quarter after a 2.7% gain in the first quarter. The personal consumption expenditure price index moved up 0.4% in March, putting the year-to-year gain at 1.8. The core personal consumption expenditure price index, which excludes food and energy, rose 0.1% in March, and translates into a 0.88% year-to-year increase. The core personal consumption expenditure price index bottomed out in December 2010 (0.73%). 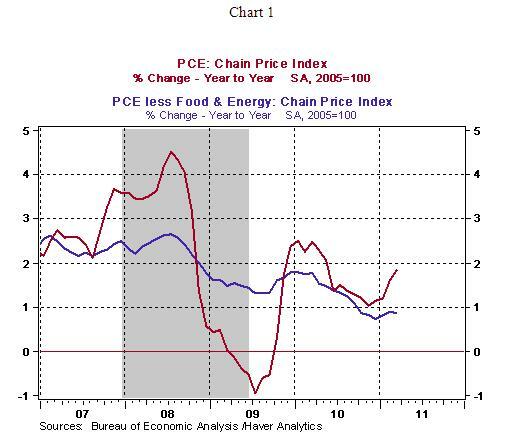 The FOMC predicts the core personal expenditure price index to range between 1.3% and 1.6% in 2011. The forecast is below the "unofficial" target of 2.0% as is the current reading. These benign readings support the current easy monetary policy stance of the Fed. Chairman Bernanke's press conference was largely about inflation and what the Fed can/will do about it. Bernanke indicated that higher prices for commodities are a transitory event and that it would matter if it made its way into core prices. Personal income moved up 0.5% in March, after a 0.4% gain in the prior month. 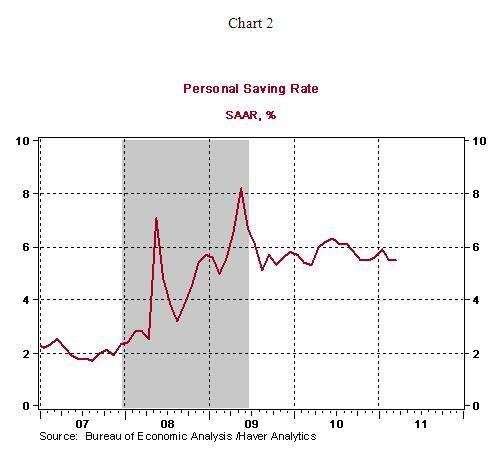 The personal saving rate held steady at 5.5% in March. 01 May 11, 12:19 Government Statistics?????? Govt. stats are rigged . You know that.